This isn’t your standard oil change. Whether your vehicle needs conventional, high mileage, synthetic blend or full synthetic oil, the Jiffy Lube Signature Service® Oil Change is comprehensive preventive maintenance to check, change, inspect, flush, fill and clean essential systems and components of your vehicle. Plus, trained Jiffy Lube® technicians go over a visual checklist to diagnose potential problems and plan any upcoming manufacturer recommended maintenance. 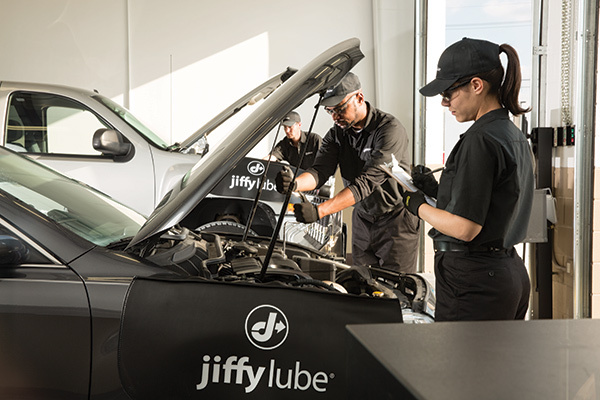 So with a Jiffy Lube Signature Service Oil Change, Jiffy Lube doesn’t just change your oil quickly and professionally to the highest industry standards. Jiffy Lube helps you Leave Worry Behind®. Jiffy Lube® helps you select the perfect motor oil for your ride. Between service visits up to 3,000 miles, customers may receive free top-offs* on motor oil with the same type of oil purchased originally and any or all of the five vital fluids listed above.